Amazon and WD are dumping these amazing 500GB externals before 1TB drives come out.Look at the price. Enough said. Amazon special for this week only. This is a great deal for a 320gb Hard Drive. Note: The list price at amazon is $149 after rebates. 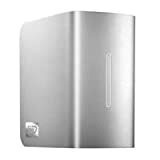 Use this code to get an additional 5% off "SAVECUSTAPPR" making this a $139.99 320GB hard drive.